Do you need help on how and where you can use wishsite? Then you have come to the right place. Take a look at our step-by-step manual to create a wishlist and new wishes or browse through our FAQ list (=Frequently Asked Questions) . If you need more information, take a look at Feedbak and questions at the end of this page. Click the green button “Create a wishlist”. When you create your wishlist, you can enter a name or description. If you don’t know what the entry in a field is used for, click the gray question mark next to the field name. There are two good reasons to provide an e-mail address. Firstly, the links to your wishlist are sent to this e-mail address. Secondly, if you forget or lose the links, you can find your wishlist again with your e-mail address. See the FAQ to find more information on how to retrieve your wish list. 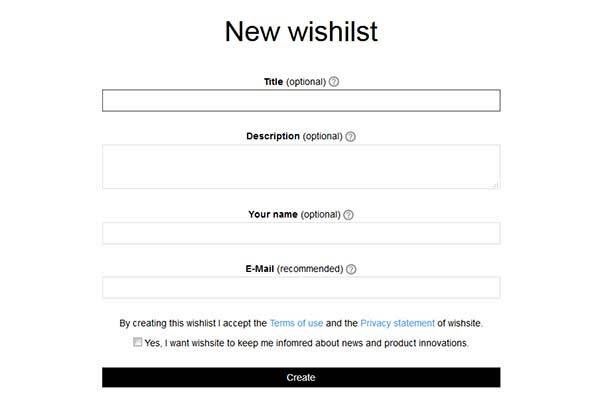 To create the wishlist, click “Create”. 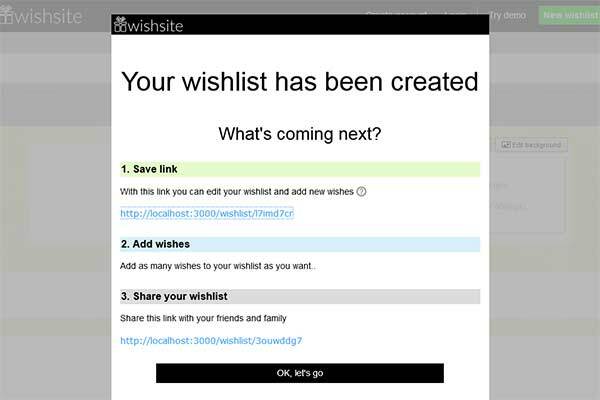 Once you have created your wishlist, the links to your wishlist are displayed on the screen. To manage your wishlist, you must remember, note down or save the link. You will need the link to access and edit your wishlist later. You can send the link to your family and friends for them to view your wishlist. You don’t have to remember this link though as it is displayed every time you view your wishlist. Click "OK, let's go” to edit your wishlist. There are two ways to add a new list to your newly created wishlist. 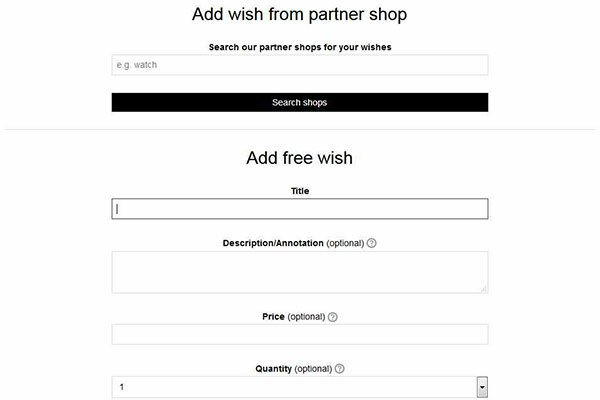 The first option is to browse through our partner shops to find wishes. Simply enter a search term in the appropriate text box. Or the second option is to create a wish directly. Simply enter a name for your wish in the form provided. You can also enter additional information such as a description of or a link to your wish. Once you have added a few wishes to your wishlist, you can send them to friends and family. Simply send the wishlist link to them by e-mail. Either copy and paste the link to an e-mail or use the integrated functions provided. You can also share your wishlist via Facebook or Twitter. As soon as you have posted your wishlist to your friends and family, you have finished your work. They can now browse through the list and reserve items what you have wished for. Everyone (apart from you of course) can see what items have been reserved and which are still waiting to be ticked off. This saves you a lot of time having to tell friends and family what you wish for. You can also add other wishes to your wishlist later. These are then displayed automatically to family and friends in the wishlist. I lost the link to my wishlist. What can I do? You can have the links to your wishsite wishlists sent at any time using our wishlist search. However we can only send you your wishlists if you saved an e-mail address when you created your wishlist. If this is not the case, you will unfortunately need to create a new wishlist (this time by providing an e-mail address). Alternatively, you can create a wishsite account and link your wishlist to this account. In this way, you don’t need to remember or note down the link to your wishlist. How can I find out wehter an item is reserved and who reserved it? 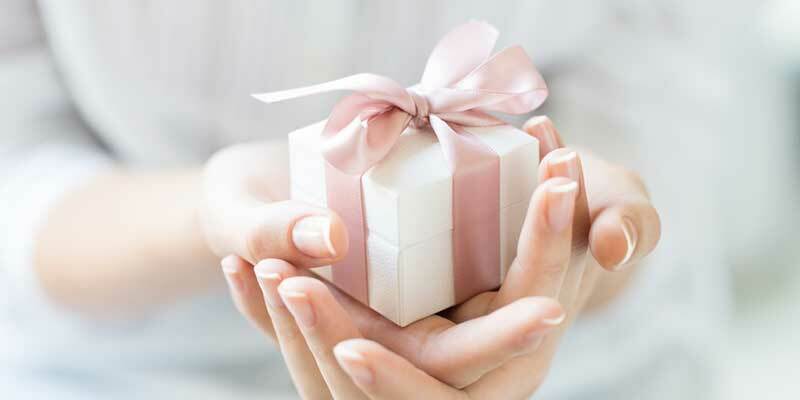 As the owner of the wishlist, you can see at any time whether a wish has been reserved and who has reserved it. To view reservations, click the “Edit” button. In the window that opens, click the “Display reservations” button at the bottom. A list of reservations for a particular wish is then displayed. How can I cancel a reservation as the owner of the wishlist? To cancel a reservation, you first need to see which reservations have been placed on the particular wish. To view reservations, click the “Edit” button on the wish. In the window that opens, click the “Display reservations” button at the bottom. A list of reservations for a particular wish is then displayed. To cancel the reservation, click the “Cancel” link next to the reservation. What do I need a wishsite account for? You do not need an account to create a wishlist with wishsite. It can be useful to open an account when, for example, you have several wishlists and would like to manage them from a central location. Or if you’d prefer to pin your account access data as the link to your wishlist. If you’re not sure, you don’t have to open an account immediately. You can wait until later. I cannot log in to my wishsite account any more! What can I do? You have forgotten your password. In this case, you can set up a new password at the following link: Forgot password?. You do not have a wishsite account. An account is not created automatically when you create a wishlist. You can access and edit your wishlist using the link which you were sent when you created the wishlist. If you have lost the link, look through the questions above to see how you can still access your wishlist. How can link my existing wishlist to my (new) wishsite account? To link an existing wishlist to your account, start by logging into your account. Once you have logged in, under the list of assigned wishlists, you will see an entry box in which you need to enter the link to your wishlist (this means the link you use as the wishlist creator to edit your wishlist. Now click the “Add wishlist” button - and you’re done! I don't need my wishlist any more. How can I delete it? Click “Edit wishlist” in your wishlist. A window pops up with a link at the bottom which you can use to delete your wishlist. How can I cancel my wish reservation? To cancel your wish reservation, simply “Reserved (disable? )” or “Reserve” (disable? )” (If the wish has been requested several times). 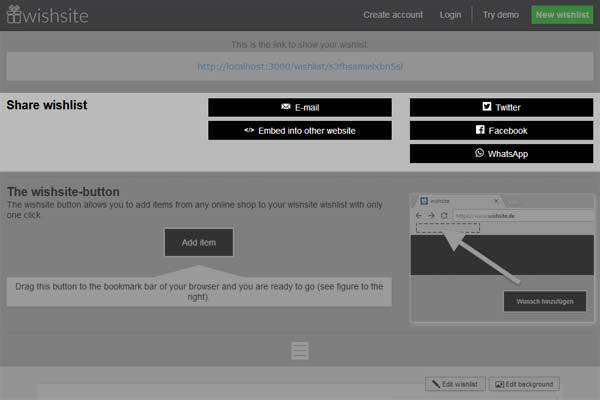 A window pops up where you need to enter the e-mail address you entered when you reserved the item. If the e-mail addresses match (upper- and lowercase irrelevant), you will be sent an e-mail. This e-mail contains a link which you must click to confirm the cancelation of the reservation (this ensures that only the person who reserved the item can cancel the reservation). Click this link (or copy it into your browser’s address bar), to cancel the reservation. Why do you ask for my e-mail address when reserving a wish? Note: You are not obliged to provide an e-mail address and we will never use this e-mail address for publicity or any other unauthorized use. There are two advantages of providing your e-mail address when you reserve a wish. Firstly, you will be sent an e-mail confirming which wish you have reserved. You can then use the e-mail later to check which wish you wanted to fulfill. Secondly, you also have the opportunity to cancel the reservation. This is only possible if you provide an e-mail address when you reserve an item. E-mail addresses allow us to make sure that you are the person who originally reserved the wish. To cancel the reservation, you will be sent an e-mail to precisely this address (to which only you have access). This ensures that not everyone can cancel your reservation. I didn't provide my e-mail address when reserving the wish. How can I still cancel the reservation? You can only cancel the reservation on a wish if you provided an e-mail address when you made the reservation. You can of course simply ask the wishlist creator to cancel your reservation for you. The creator is assigned the right to cancel any reservation. If the creator does not know how to cancel a reservation, he/she can simply consult this Help page. The questions above explain how wishlist creators can cancel reservations. If you haven’t found an answer to your question or you’d like to suggest improvements, go to our Feedback forum or get in touch with us at Contact.